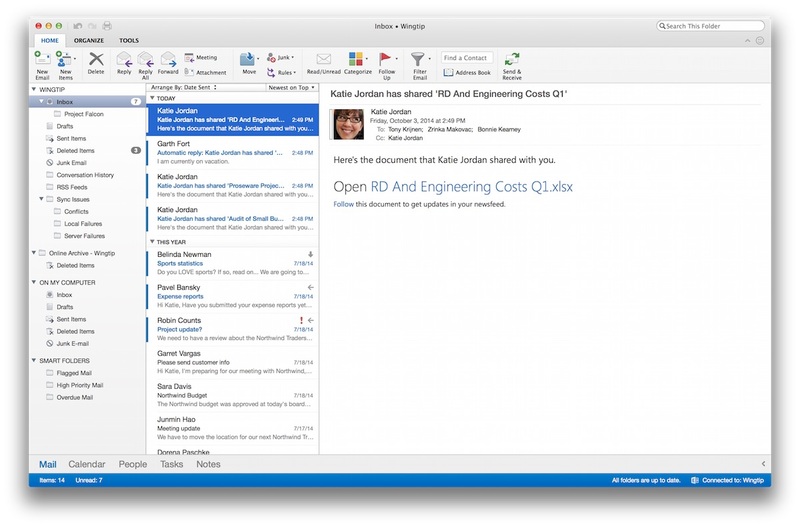 Microsoft today announced the immediate launch of a new Outlook for Mac for Office 365 users, bringing a new look and a number of improvements as leaked earlier this week. - Better performance and reliability as a result of a new threading model and database improvements. - A new modern user interface with improved scrolling and agility when switching between Ribbon tabs. - Online archive support for searching Exchange (online or on-premises) archived mail. - Master Category List support and enhancements delivering access to category lists (name and color) and sync between Mac, Windows and OWA clients. - Office 365 push email support for real-time email delivery. - Faster first-run and email download experience with improved Exchange Web Services syncing. Office 365 subscribers can access the new Outlook for Mac through their account pages, while subscribers who already have Outlook for Mac 2011 suite installed on their machines should follow these instructions for moving to the new Outlook for Mac. Microsoft also provided an update on the next full version of Office for Mac, noting that development on the suite had been pushed back from its usual schedule due to Microsoft's work on prioritizing mobile and cloud development. The latest roadmap for Office for Mac, which includes Word, Excel, PowerPoint, and OneNote includes a public beta launching in the first half of 2015 and a final release coming in the second half of the year. Both Office 365 and perpetual license versions will launch in the same timeframe. Some details on the next Office for Mac were also leaked earlier this week. Still wish you could buy the software outright and own it. 365 only? Why is MS begging companies to move away from their enterprise software? Also, you should note that it's for Outlook 365 subscribers only. While my company uses Office 365, we have our own internal Exchange servers, so the new Outlook is useless as it won't activate. I have hated Outlook for over a decade. When I was doing IT work up until last year I could tell the users that used it rather than Thunderbird; they called for help a lot more often. It's buggy, flaky, unintuitive, and designed by morons. It's the default email client where I work and I use Mail on my iPad most of the time just because I hate it so much. Looking down the list of "improvements" to Outlook I don't see anything that would change my opinion. It took them over 4 years to turn Outlook into a subscription based clone of Apple Mail? Unimpressed. Dominos server is light years ahead of Exchange! Its model has always been better than the pile of garbage known as Exchange. Storing mail files in one huge database is a cluster-F and makes backing up and restoring a nightmare. Compared to a file for each user. Domino also has clustering built in that works, groupware functions that are better than *****Point. And the best part is you can run Domino on just about any OS: Windows, Linux, OS X, AIX, AS/400, HP/UX, etc. Unlike Exchange that is tied to AD/Windows. The client needs help but again, you get 100% compatibility over Windows, OS X, and Linux. Version 9 of Domino has gotten better and has a decent look and feel. Sorry, Exchange/Outlook like most of what Microsoft makes is garbage! Ask any IT person about PST files and you'll get an earful! Spoken like someone who hasn't touched Exchange in 14 years. Ok just installed this and it basically is just Outlook 2011 with a slightly new skin. * When you look under the hood, outside of some Exchange/Office 365 push support, it is the same client. * The preferences are limited. * No Notification Center support? Very disappointed in this as they have been working on this for YEARS and just did a slight UI update. PLUS the major release is now a year away. Last year they said it would be late 2014. Microsoft should have released this in the App Store like they did with Onenote. Outlook should be FREE for Mac and Windows users and based on the service it will activate features/functions. If you have Exchange you get all the Exchange features, if you have just standard email clients you can still use it. I really hope that in a year from now we get a true desktop client and not this Outlook Lite version. with the big difference - OUTLOOK WORKS - Apple Mail is terrible. Search the forums and see all the trouble. Apple's Office/iWork thingy and Mail are terrible. Microsoft's superior there.